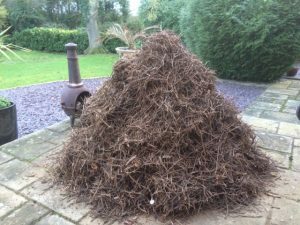 Another Birds Nest Removed – A Monster This Time! 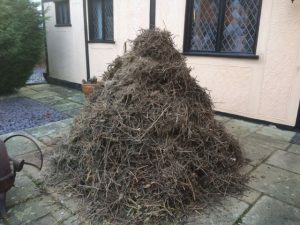 Saffron Walden Sweeps Uncategorized Another Birds Nest Removed – A Monster This Time! Last week I attended a customer who had just moved into a very old farm-house just the other side of Hempstead. The new occupier informed me that the property had stood empty for a long time before they had purchased it. By all accounts the previous occupant had not used the two very large inglenook chimneys for a very long time. Both these chimneys had a hood and register plate configuration and both came with two inspection hatches each. However, this is were the good news ended, both chimneys which were in excess of 10 meters tall and 2 meters wide were completely full of nest material from top to bottom. To complicate meters and make the nest removal more difficult, the inspection hatches for both register plates were very small indeed and were as one plate was reasonably accessible at eye level, the second plate was below hip level. In both instances I was able to clear the nests using a combination of the pigs tail tool and rods, and power sweeping with the metal flail. 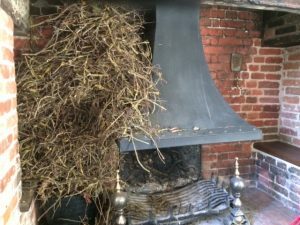 The flail is very good at breaking up the interlocking integrity of the nest, whereas the pigs tail is very good for latching on to the nest material and pulling it down the chimney. It was then a process of physically dragging the twigs and other material through the small inspection hatches and carrying it outside in trugs. One of the photographs shows this very process, with a portion of the removed nest having just been pulled through the register plate. 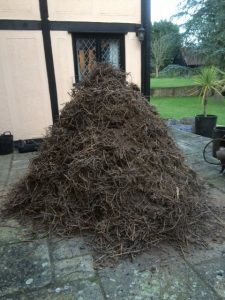 The customer requested that I put all the removed nest material just outside the house on a patio. As you can see there was rather a substantial amount of this, as it formed a small mountain over 6 feet in height. Needless to say it took me a whole day to clear both chimneys and that was working consistently without a break through the day. A monster effort I think you will agree? I certainly slept well that night!